I'm loving how Netflix lets me streams TV shows I never got to watch after Marlie was born. It's like the 2009 fall season all over again! This week I watched season 1 of Drop Dead Diva. This is my kind of show...a dramedy about a spunky, smart and sassy lawyer. She is also way pretty and can sing her a$$ off! My new Panasonic DMC-FZ35 LUMIX digital camera. Damon bought me one for Mother's Day after months of hearing me gripe and even whine a little about all the moments I failed to capture because of the piece of garbage that was masquerading as my old camera. This bad boy is going to put me in the mommy photography big leagues! Glad you got a new camera-sharp! I love my DVR! i love Drop Dead Diva...such a funny show..i've been out of the loop since season 1 but i should go back to lifetime..
Week I'm loving your new blog design!! It's beautiful! And totally with you on the Netflix tip. Gonna try Drop Dead Diva after I finish the first season of Sons of Anarchy. Netflix is the best thing ever since we canceled cable! Finally, so excited to see what you do with that camera!! Yay! Nice work Damon! Love Instant Queue! I started watching Weeds and I'm hooked. Need to add that one to my queue. And maybe Army Wives too if they have it. OK - I have a LUMIX camera but it is not that fancy LOL. 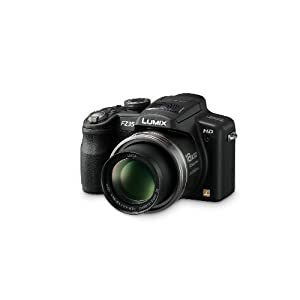 "My new Panasonic DMC-FZ35 LUMIX digital camera. " You're a VERY LUCKY MAMA!!!! As a side question...where is the button to view previous posts??? Have I gone totally blind?